The top four floors of this impressive, 8-story, landmark building were converted into 29 residential condominium apartments in 2006. The building occupies the full block between Broadway and Amsterdam Avenue and 73rd and 74th Street and dominates Verdi Square and the adjoining express subway station pavilion. The apartments have their own entrance at 2112 Broadway. The huge and grand, four-story high banking hall of the Apple Bank at the base of the building was not altered in the conversion of the building's upper floors that were formerly used as offices. 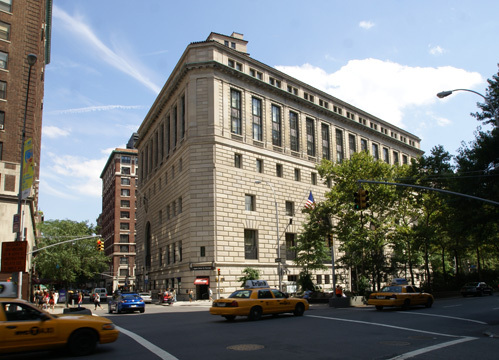 The bank has its main entrance in the middle of its frontage on Broadway and also on 73rd Street facing Verdi Square. SLCE Architects designed the residential conversion and each apartment has a different layout, all with large entry galleries. Six of the apartments are to be duplexes with roof terraces. The residential portion of the building has a 24-hour concierge in the lobby that has been designed by Beyer Blinder Belle Architects, a gym inside the bank's vault, a "canine shower for grooming pets," a commercial laundry facility and bronze mailboxes "at each home's entrance." The building has no garage but there is excellent public transportation. The landmark building was built in 1928 for the Central Savings Bank that formerly was located at 14th Street and Fourth Avenue. 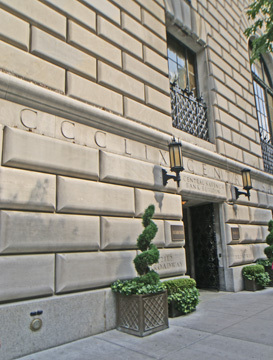 It was designed by York & Sawyer in the same monumental, Italian Renaissance-palazzo style the architects employed at the Federal Reserve Bank of New York Building in Lower Manhattan. The bank was founded in 1859 as the German Savings Bank in the City of New York and changed its name to the Central Savings Bank during World War I and subsequently it became the Apple Bank. 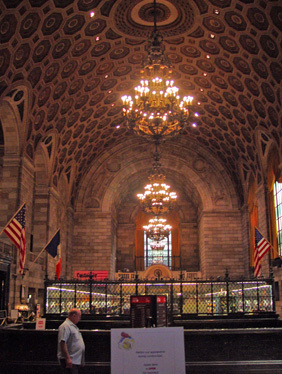 The bank continues to operate within the building's vast and spectacular vaulted banking hallone of the city's most spectacular interior spaces that is a designated interior landmark. The building commands one of the few prominent "key" sites in Manhattan at the intersection of two avenues such as the Flatiron Building at 23rd Street and the former site of the Herald Tribune at 35th Street between Broadway and The Avenue of the Americas and the former Times Tower at 43rd Street between Broadway and Seventh Avenue. The building was described by Elliot Willensky and Norval White in "The A.I.A. Guide to New York City Architecture, Fourth Edition," (Three Rivers Press, 2000), as "one of the areas noblest and most imposing edifices." Units range from 1,200-square-foot two-bedrooms to 3,800-square-foot three-bedrooms and have 11- to 18-foot ceilings. They were priced initially at $2 million to $8 million. Stahl Real Estate, the owners of the property presented plans to the city's Landmarks Preservation Commission to make minor changes to an exit on 74th Street that is used as a second means of egress for the condominium apartments. The solution proposed was to leave the west side of the very handsome gates in place and to leave permanently open the east side and install a glass "panic" door with push-bar just inside the entrance.